The Stimulus Package is now available for all three formats: Xbox 360 (Xbox LIVE), PlayStation 3 (PSN) and PC (Steam). The DLC was an Xbox 360 exclusive for 30 days, but during that time Infinity Ward's first map pack had over 1 million downloads within 24 hours of its release. Within a week the DLC was downloaded over 2,5 million times! The Stimulus Package consists of five multiplayer maps - three totally new ones and two brought back from Call of Duty 4. It's likely that some remakes might end up in the advanced warfare multiplayer maps list sometime in 2015. Bailout: three-storey apartment complex with no place to camp, as every point has its own flank weakness. The map throws players into close quarters conflicts with advanced warfare in every corner! Storm: abandoned warehouse district which is surrounded by messy, industrial loading bays and driveways - there are hundreds of places to hide! Salvage: frozen junkyard which keep players on the move due to its compact size. 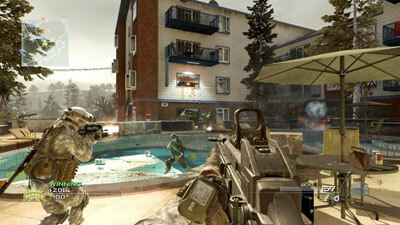 Crash (COD4 remake): war-torn urban environment with a few great sniping spots for ghosts. Overgrown (COD4 remake): rural map with large outside areas, which makes it great for snipers in ghillie suits. If you play Modern Warfare 2 regularly the Stimulus Package is totally worth the price, as the maps offer quite a bit of variety. Ghosts, the latest COD game, features Call of Duty: Ghosts Killstreaks from MW2 and has a few remakes in store for long time fans.